A better performance by Wharfedale but still no points. This was a battle of defences. Both sides are in the top 4 in the league with regard to points scored against them and are also in the bottom four for points scored. This was never going to be a high scoring try fest and the wind caused problems for both sides. Points for and against may be similar but there is now a gulf in the respective league positions of the two clubs. Otley, as of last Saturday, have managed to win 12 of their games and sit in 5th place in the table. Dale have won seven matches and hover just above relegation with a seven-point cushion above South Leicester. A hard-fought battle was just edged by Otley who have now done the double over Wharfedale. The scrum was dominated by Otley but in other spheres of the game the two sides were on a par. Otley’s main attacking weapon, full back Ben MaGee, only lasted 23 minutes but was influential for a short period in causing problems for the Dale defence. Dale started well and were camped in Otley’s half for the first 15 minutes. Jack Blakeney-Edwards made a clean break but was caught just short of the line and Otley’s defence held. Dale were patient in their build up going through over 40 phases before being held up and giving a scrum to Otley on their 10-metre line. The scrum penalty was followed by a solid catch and drive at the line out and a second penalty 32 metres out which was converted by Joe Rowntree. Dale attacked again from the restart and soon had an attacking line-out. The ball was won but the drive halted. Any momentum was lost with a knock-on in midfield and an Otley scrum. With the scrum penalty waiting Otley ran the ball and Magee broke up to the half way line. Kicks were exchanged before Magee received the ball and ran back deep into Dale territory. A further break by William Burns shattered the Dale defence and Otley spun the ball right to use the overlap and create an unconverted try for Adam Malthouse. Otley pressed the attack home despite having two players receiving treatment. The next few minutes were a scrappy affair with the ball, at times, bouncing around and possession a bit of a lottery. Dale did well to keep the game in mid-field and eventually break out. Phil Woodhead made a break up to half-way and a penalty followed. Blakeney-Edwards nudged the ball forwards and Dale attacked. A high tackle resulted in a yellow card for Otley’s James Dyson. Jack Blakeney-Edwards got Wharfedale on the scoreboard by converting the penalty kick on the stroke of half-time. Otley opened the second half with good possession and penetrative running with the ball. Joe Graham ended a sweeping move with an unconverted try to give Otley a 13-3 lead. Graham was put clear by Adam Malthouse with a well-timed offload that left the defence looking on in despair. A scrum penalty led to a successful 48 metre penalty kick to extend the lead and leave the visitors needing two converted tries to win the match. Ben Sowery was also yellow-carded for repeated technical offences at the set piece. Wharfedale were now stung into action and began to assert pressure on the home side. Penalties followed against Otley and after a warning Laurence Sanderson was sin binned. From the next 5 metre line-out a catch and drive finished with Dan Stockdale crashing over. The wind was too strong for Blakeney-Edwards to add the extras but Dale had closed the gap with over 10 minutes left. This was the end of the scoring and despite late efforts by Dale Otley held on to the 8-point lead. Wharfedale have now lost the last three games and even more worrying have only gained one bonus point since the convincing victory over Tynedale back on 8th December. The word on many of the faithful’s lips was penetration. Dale did have a good share of possession and territory but could not finish off with a score on too many occasions. 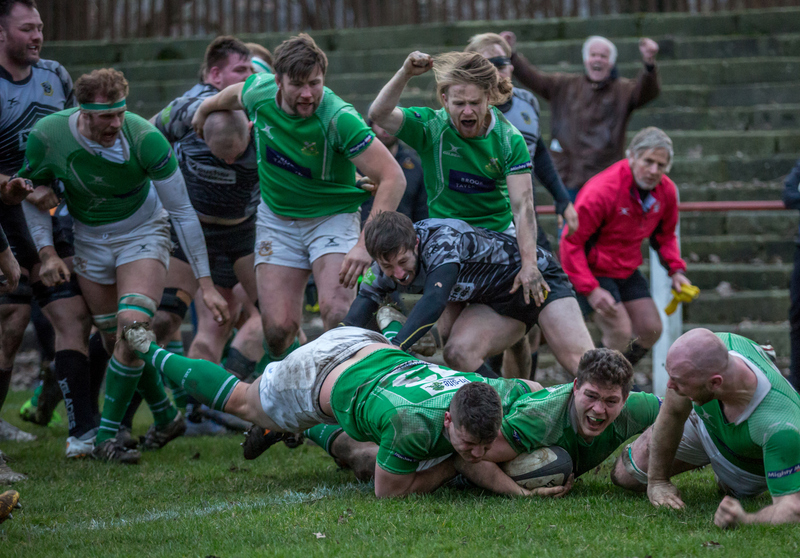 Wharfedale: – Bullough; Wellock (Hirst 60, Wellock 67), Blackwell, Edwards, Hamilton; Blakeney-Edwards, Woodhead; Altham (Sowrey 32), Stockdale, Hirst (Asejevs 40), Hedgley, Rhodes (Baldwin 53), Houghton, Tyson (Walker 51), Burridge.